Must be connected via Bluetooth. Good battery life that can last for 80 hours and can be recharged via USB mini cable. Cannot be connected via USB cable. Cable is only for charging controller. Usable with PC by using a Toshiba Bluetooth Stack-enabled Bluetooth Adapter or potentially any bluetooth adapter that uses the windows bluetooth stack via the hotfix mentioned below. New hotfix makes potentially work with any Bluetooth adapter that uses the Windows stack on windows 8/10, no need for toshiba drivers. Free to download, only hardware you may need is a Bluetooth adapter. 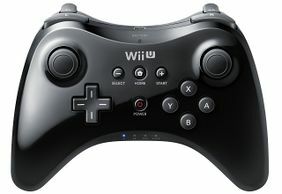 Also supports Wii Remotes, Nunchuks, Classic Controller, Classic Controller Pro and the HORI Battle Pad. Only official Nintendo Wii U Pro Controllers supported. Has switch on side of adapter, allowing for both XInput and DirectInput modes natively. XInput should work with regular drivers, for rumble to work with DirectInput mode, drivers need to be downloaded from the manufacturers website. Can connect 1 Pro Controller in XInput Mode and 4 Pro Controllers in DirectInput Mode. All controllers that can be synced and work with regular Wii U should work, including third party ones. Includes turbo mode. Pressing "Home" and button toggles turbo for that button. To disable turbo for all buttons press home button twice quickly. With latest firmware (V04, February 10, 2015) it's possible to switch button modes to either A=A (button letters matching) or B=A (button layout matching 360 controller). To do this press "+" (Start) and "A" button for three seconds for A=A layout and "+" and "B" buttons for three seconds for B=A layout. Download latest firmware update from manufacturers website and start bundled executable. Press and hold adapters "sync" button and plug it into USB. Press "Update firmware" and close program after succesfull update. A bit more expensive than other options but provides other useful features and great compatibility. Supports Streaming games from your TV via your network and works with the pro controller via built in bluetooth. Can be used just to send input from a Pro Controller to a PC. Just go into Streaming options, hit y and disable video and audio streaming. Supports lots of other controllers like DS3, DS4, Xbox One and 360. Works without any drivers on any operating system that supports Steam. Either you need to be playing games streamed to your TV, have the PC in the same room as the TV or plug it in to a monitor via HDMI to set it up. Once you have it set up then you can play from your normal monitor. Won't work great unless you connect it to LAN or a pretty good low latency wi-fi. This page was last edited on 18 December 2018, at 18:53.